I took a deep breath and began typing the first letter – one and half pages. There were words I couldn’t decipher. 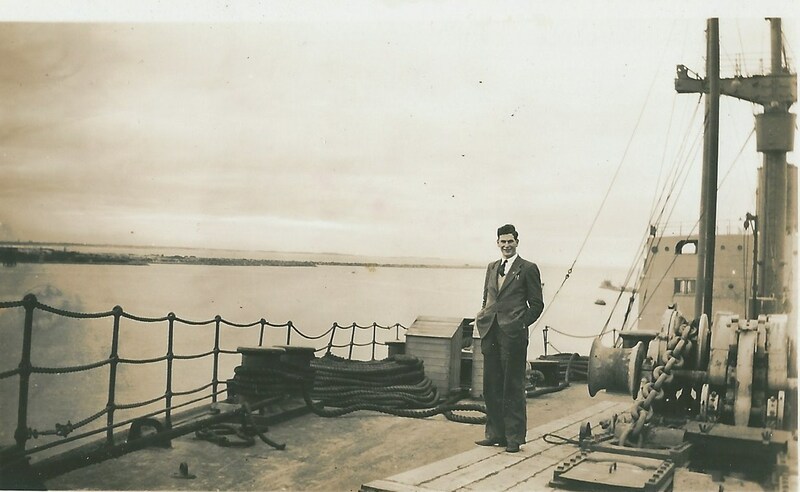 He was on the ship, “The Triona”. He talked about the Lascars – who were they? Who were the Mc Raes he saw before he left? I penned a note to ask my Aunt. She was bound to know. At 94, she was still as sharp as a tack. I typed up the next letter ’20 June 1948’. Three weeks in and he was still on the ship. There was a diagram of his quarters and a description of the food he’d eaten. I guess he was a typical 18 year old boy who loved to eat. He wondered if his new nephew or niece had arrived. He worried about my grandfather and if he was coping with the garden without him. He was sick of being at sea. I finished typing the second letter and pondered. It dawned on me that I was getting to know my father as a teenager. What child ever gets to do that? He was 28 when I was born and my earliest memories of him began at three. I was looking up at him, my neck craned to watch him shave off his red fluffy beard – he would have been 31. I really got to know him in his mid to late 30’s and by the time I was a teenager with a consciousness, he was already in his 40’s. By then we were already worlds apart. What an extraordinary opportunity I’d been given to discover my father as a boy and watch him turn into a man – into the man I knew and loved. He was the man who I had adored and followed everywhere as a kid; who did no wrong in my eyes – the teacher, the larrikin, the organiser, the drinker; the fixer, the adventurer. The man,I had stood up to as a teenager, and fiercely argued with, for my own independence. The man who had been my champion; who had been proud of everything I had ever done even though I shrugged it off. The man who could fly off the handle for the smallest of things yet hated confrontations. The man, who in later years, withdrew from me and everyone else, into his own world. Had he always been like that? This entry was posted in Writing and tagged fathers on May 19, 2015 by S.C. Karakaltsas.